You are here: Home / Blog / Wine with Winston / Bud Break Bonanza!!! You know what they say! It’s a dog’s life! I know I have it good, I’ve got a mom and dad who love me very much, I’ve got rolling hills of land to run around on, and I even have my own blog. You might think that it couldn’t get better than that, but think again. Over the past month I have been lucky enough to have my very best friend (and little nephew) Ryland come stay with me. We were assigned a very important task, and we definitely earned our bones. Gene, our Vineyard Manager, and Taylor, my big brother, had a lot of work to do on the vines over the past month, and mom and dad sent us out to make sure that they were doing everything they needed to do. We laid in the shaded, soft grass and watched as they inspected each vine to determine its health. They were looking for bud swell and the magical bud break, As they inspected the growing shoots, they tied them to the cordons to begin training their future growth. Most people think of the spring season as a time of new beginnings, but the growth cycle of the grape vine actually renews each fall. 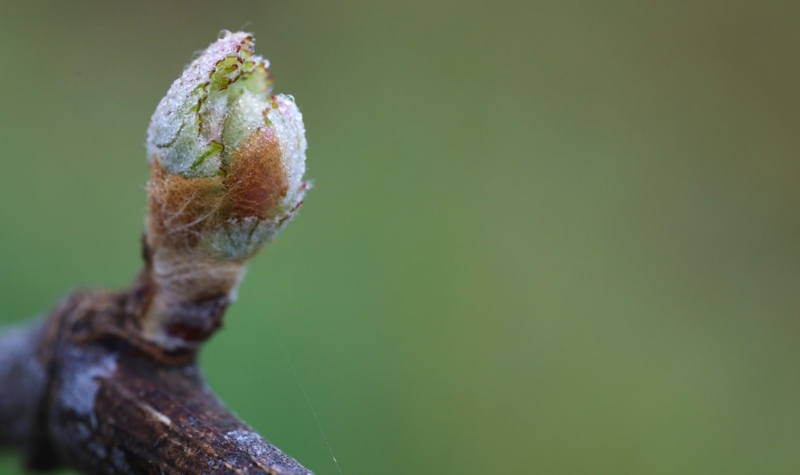 That is when the new buds begin to form on the vines as hard brown bumps, and they rest with a protective cover over the winter. In the early spring, as soon as ground temps break the 50⁰ mark, vines begin to bleed. The roots wake up and pump water through the plant, distributing the needed “energy fuels” throughout the vine. These sugars, minerals, and hormones will all go to work immediately nourishing the sleeping buds and preparing them for bud swell. During the bleeding process, up to 1.5 litres of water can be pumped up through the plant and will “bleed” out of its pruning wounds. Bud swell is the beautiful phenomena that begins to turn vineyards from the winter brown hues to the lush yellow-gold colors of all newly awakened plants. Robert Frost warned us, though, that “nothing gold can stay,” and to be sure, these golden colors will soon erupt into a lush and vivid green as the bud swells burst into the bud break. Tightly furled in these nuggets of green are everything the vine needs to make its next year of growth: leaves, shoots, and even the fruit clusters that will mature by the end of the growing season. As Gene and Taylor moved through the rows examining and admiring each of the individual vines, they tied them to the cordon wires of the trellis to train their growth. Next on the schedule, is stripping the trunks of their leaves. This will temporarily “de-green” the vineyard, but it is just to ensure that the energy of the plant is being used to produce healthy and vibrant shoots. Each plant should have only two trunks, and by taking off the leaves, we are making certain that no additional shoots grow where we don’t want them. I have a few more supervisor shifts coming up, and I will be meeting with Jeanette, our vineyard consultant, so look for a “growing” wealth of information to come! https://www.brixandcolumns.com/wp-content/uploads/2018/05/budbreakpost.jpg 980 1650 Stephanie Pence /wp-content/themes/sixpenny/images/logo.svg/ Stephanie Pence2018-05-09 17:17:392018-07-07 14:50:58Bud Break Bonanza!! !